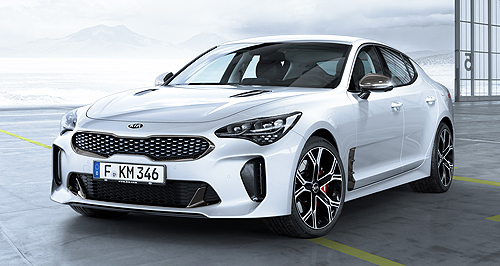 KIA Motors Australia (KMAu) has released a standard equipment summary for its Stinger sedan that is set to launch next month, with Brembo brakes and a limited-slip differential (LSD) featuring as standard on all twin-turbo V6 petrol models. With 2.0-litre turbo four-cylinder versions still yet to be detailed, 3.3-litre variants of the Stinger – comprising $48,990 S, $55,990 Si and $59,990 GT – will all include Apple CarPlay and Android Auto smartphone mirroring technology, satellite navigation, twin 12-volt and USB outlets, rearview camera with rear parking sensors and rear cross-traffic alert, an active pop-up bonnet, LED daytime running lights and three child restraint points (two Isofix) as standard. The entry-level Stinger S will also feature 18-inch alloy wheels (with 225/45 Continental ContiSport Contact 5 tyres), a 7.0-inch touchscreen with seven-speaker audio, artificial leather trim with eight-way driver/six-way passenger electric adjustment, and a monochromatic trip computer display. A further $7000 premium to the Stinger Si will add 19-inch alloy wheels (with 225/40 front and 255/35 rear tyres of the same brand as above), forward collision alert with autonomous emergency braking (AEB), lane-keep assistance, driver attention alert, active cruise control, underfloor storage tray and net, plus a larger 8.0-inch touchscreen with nine-speaker audio (two as subwoofers). Another $4000 will get buyers into the Stinger GT – claimed by KMAu to be by some margin the most popular version based on pre-orders – which adds features such as a blind-spot monitor, head-up display and electric sunroof. Such features are standard on the Kia’s closest rival, the soon-to-be-replaced Holden Commodore SS-V Redline, which is also more affordably priced from $56,190 in auto guise – although it lacks AEB and active cruise control. Compared with the Holden the Stinger GT also adds a 360-degree camera, adaptive LED headlights with auto-levelling and auto up/down high-beam, electro-chromatic door mirrors, full Nappa leather seat trim with electric front-seat side bolstering and driver’s thigh support adjustment, two-position front memory seats, alloy pedals, suede rooflining, wireless charging and 7.0-inch colour driver display with 15-speaker Harman Kardon audio. Mechanically it will also introduce a three-mode adaptive suspension setup, with Comfort, Sport and Smart (or automatically adjusting) modes acting on the suspension as well as the steering and throttle/transmission, while Eco alters the latter and Custom permits settings to be mixed and matched. While the adaptive set-up of the Stinger GT replaces the fixed dampers used in the Stinger S and Si, both have been locally tuned by KMAu engineers. An Australian-developed active sports exhaust will also be optional on all models, for an as-yet unspecified charge. The standard-across-the-range Brembo brakes have been detailed as 350mm four-piston front/340mm twin-piston rear units. KMAu has further revealed that the Stinger S, Si and GT have a tare weight of 1780kg and the models can all accelerate 0-100km/h in 4.9 seconds – in both respects identical to a Commodore SS-V Redline – thanks to a launch control feature, an eight-speed automatic transmission, plus 272kW of power at 6000rpm and 510Nm of torque delivered from 1300rpm until 4500rpm. In a statement, KMAu chief operating officer Damien Meredith said: “There is a belief that any entry-level model will be, for want of a better description, sparse, (but) that is not the case with the Stinger. “The S has the same brilliant 3.3-litre bi-turbo engine as the GT, the same eight-speed gearbox with sports paddles as the GT, and the same ability to sprint from 0-100km/h in 4.9 seconds. And there is safety and comfort equipment in this car that you would not normally see in anything but the top of the model range, including satellite navigation. As reported, Kia’s new range-topper has already secured 100 local pre-orders ahead of its Australian on-sale in late September. KMAu has also said it hoped the entire Stinger range would net 400 sales per month. The 2.0-litre turbo four-cylinder versions, with 182kW at 6200rpm and 353Nm from 1400rpm until 4000rpm, will start production later this year.